Mahamaya @Gili Meno (Lombok, Indonesia) | Get Your Grub On! Proper food at Turtle Point. After a few days into our island holidays we switched over to Gili Meno, the smaller and more quiet sister of Trawangan. Our resort there, the Mahamaya, was a beautiful and small boutique hotel with a wonderful reef for snorkelling just in front. In the evening they did setup tables at the beach for people to have some food in a nice setting without booking these weird staged romantic dinners you’ll often get in places like this and today they had fresh grilled fish as a special. Our exceptionally friendly and helpful waiter for the evening helped us choosing the right fish, which turned out to be a humongous red snapper. It was delicious and finally some proper local style food. 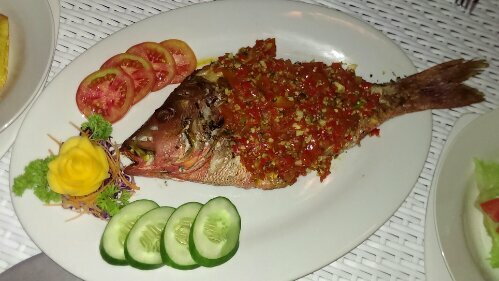 The bbq fish was very meaty and juicy and was covered with a flavourful mix of garlic, cilantro and fragrant fruity and mildly spicy chilli. I just wished the heat would have kicked in a bit stronger. Fresh seafood straight off the boat, stunning surroundings and outstanding service from all staff made this a great start into the second half of our holidays. I miss this place, terima kasih.